Jill DeWit: And I’m Jill DeWit, broadcasting from sunny, southern California. Steven Butala: Today, Jill and I talk about working with your spouse. Jill DeWit: Sorry, it already makes me laugh. Jill DeWit: I don’t know why this makes me laugh. Steven Butala: It took 20 minutes. She has a lot to say. Jill DeWit: Oh, it’s funny. Steven Butala: So, before we hear what Jill has to say about working with your spouse, let’s take a question posted by one of our members. This could end up in a full blown argument. Steven Butala: I was thinking we could have huge on the air argument. Steven Butala: She got done writing for 20 minutes, I just let her go, she turned and looked at me and said, “Well there’s good things and bad things about it.” And that was it. And then she brushed her hair. Jill DeWit: I have the pros, and I have the … that’s exactly what I did. Steven Butala: She wrote herself into an anger state. Every man who’s listening’s gonna know what I’m talking about. Steven Butala: He just got red all of a sudden. I didn’t do anything, I was just sitting there. Steven Butala: Because she probably thought about something that happened two years ago, or whatever, and it wrecked the whole night. Jill DeWit: If only I knew this is how it would go … awesome. Steven Butala: We’re gonna apply it to real estate, so don’t worry. Jill DeWit: It’s perfect, you’ll love all my stuff. Steven Butala: Let’s take a question posted from our Land Academy, Land Investor’s Online Community. Steven Butala: It’s an attribute. Steven Butala: No. It’s awesome. There are people who look for … now you have two pieces of property! Jill DeWit: Yeah! I can put up something here and something there. Jill DeWit: That’s kinda cool. Steven Butala: I mean it was the coolest thing ever! Jill DeWit: And you can go to one house or the other, I like that. Steven Butala: It’s a little kid’s dream, and we always had fishing lines going down in the house into the water, and there was always something on the line, in Michigan. Jill DeWit: You’ve never told me this. Steven Butala: Yeah, it was really cool. I just thought about it now, I dunno why! Jill DeWit: Wow. A fish called Wanda! Steven Butala: Most of the memories I have of my childhood are not positive, so that is one positive. Jill DeWit: This is good. I like this, you’re making progress, sweetheart! Welcome to relationship week. Steven’s gonna be crying by Friday. Steven Butala: I’m already crying on the inside. Jill DeWit: Okay, should I get to property two? Steven Butala: All kidding aside, all kidding aside. Property one? That’s a huge attribute, go ahead. Jill DeWit: That’s what I was gonna say. Steven Butala: Our business partner, if you can actually get an easement into the property. Steven Butala: It’s a lot easier sometimes then you’d think, especially in an urban area. Steven Butala: You just can’t see it. Steven Butala: In fact, that’s my guess. Jill DeWit: And they will smoke that out. Steven Butala: That’s my guess. Usually give-away there is, for Infill lots, is if it’s got really uneven terrain, like it’s really slope-y. Then it was probably deeded when it was subdivided. It was leftover property. For some reason, back, way back, they assign unusable properties APN’s, and they don’t do that anymore. But a lot of times, more often than not, those are gems. Jill DeWit: Well Infill Reports will do all that. Steven Butala: Yeah, I mean they can do it for you. So if you don’t wanna do the work, call Infill Report. Go to infillreports.com and email us there, or just you could just order it. Steven Butala: It’s your department. Jill DeWit: Calling that planning and zoning, and together putting together the most awesome report. Steven Butala: You get a title, you get the condition of title. I mean it’s like having your own due diligence department. Jill DeWit: Yeah, there’s nothing else you have to do then. That’s what makes it great. Steven Butala: I need to write that down, ’cause that’s a good slogan for that company. Jill DeWit: Okay. I’m writing it down. Jill DeWit: And she does. Jill DeWit: Alright, you wanna hear my pros and my cons? Steven Butala: This is the meat of the show. Jill DeWit: I’m jumping in already. This is so funny! Okay, so here’s the deal. There are definitely pros and there are cons to working with your spouse. What’s interesting is, I find that we have a lot of people in our community that are couples, that do work together. And it’s so great. Steven Butala: I think it’s ’cause of us. Jill DeWit: I know! They see its possible. Jill DeWit: They don’t know what we went through. Steven Butala: Only the positive stuff. Steven Butala: That happens, say it just like that. Jill DeWit: They know what their roles are, it’s so great. So, I have three pros and three cons to working with your spouse. So one awesome pro to working with your spouse is, you are on the same page about investing money, and your end business goal. ’cause that’s one of the things you guys … they wouldn’t be into it, obviously, if you didn’t have that conversation, “Hey, let’s do this together. Let’s start our own investment company, here’s what I think we should put into it. They’re on the same page. Now, here’s the con to that. And by the way, when I talk to people and they’re thinking about this, that’s a question that I always ask people too. I’m like, “Okay, what is your significant other think, because they don’t have to be doing it with you, but if they are not on the same page and supportive of you doing this, it’s gonna be so much harder and it might not work. Because if they say, “What, you spent how much on that property?” You know? They’re just giving you a hard time the whole way through it. 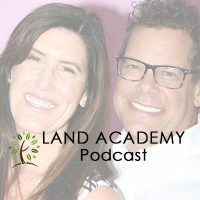 Steven Butala: Or, if they say something like this, “Well Land Academy sounds like a great idea, after you finish the 16 projects that you’ve already started and you haven’t finished. Steven Butala: That’s a good sign that you spouse is not on the same page. Steven Butala: Or on the same team. It may be she doesn’t like you at all. Jill DeWit: That could be. Okay so, again I said this. So the pro is, you’re on the same page, investing money in the end business goal, but con to that is, now they have an opinion about how much you’re spending and the business goals. Steven Butala: Yeah so you may have messed up there already, by letting that person in. I’m not joking. Sometimes people shouldn’t be let into stuff. Jill DeWit: You know what, that’s fair. You know what? You’re right. That’s fair. Steven Butala: Do you wanna be in a relationship where you tell your spouse and your spouse tells you everything? Every single thing about that person? Yesterday I just told a story that Jill’s never heard, and we’ve been together 10 years. That’s good. Jill DeWit: I agree, I agree. Steven Butala: But maybe she forgot, and that’s fine too. Jill DeWit: That happens often. I didn’t know about Aunt Wanda, I really didn’t know. So, it’s cool. Alright, so here’s another pro. A pro is, you share the work. Working with your spouse you get to share the work, and hopefully divide up the tasks 50/50. Now here’ the con to that. There are always some tasks that are left over, that nobody wants to do, number one. And then number two is, sometimes you feel like 50/50 is like 60/40, or 70/30. Don’t you think? Steven Butala: There’s always gonna be confrontation. I’m gonna work through my list while you’re talking. Steven Butala: Always. So plan for it. And resolving conflict in any relationship is something that should be practiced and rehearsed, and you should have plan A, plan B and plan C. My plan C is to remove myself from the environment if it’s just not working, and then let everything cool off. It’s just how it is. Some people walk around thinking there should never be any confrontation in a relationship. Those people are going to be really upset throughout their whole life. Jill DeWit: That was me. Jill DeWit: For a while. Sometimes it still is me, ’cause I do not like confrontation. At all. Steven Butala: I don’t like it, but stuff doesn’t get done. Jill DeWit: No, I don’t like it at all. Steven Butala: So, Jill and I are fortunate enough to have the same immediate goal, and I think the same super long-term goal. Jill DeWit: I’m sure we do, that was the basis for a lot of things that we do and why we’re still here today. ‘Cause when we sat down and lined up goals, like, “Where do you want to end? Where do you want to end?” They were really similar and, God, that makes it so much easier. Steven Butala: Jill is people-centric, and I am money-centric. Steven Butala: I will put money before people averaged seven days a week. And Jill doesn’t, and it’s a good thing. It’s a good yin yang thing. Where Jill will turn that all around in her favor and somehow make it cheaper for us. End up getting a better deal for us on the buy or the sell side, I’ve seen it happen 50 times. Steven Butala: So, I don’t mean to overstep my balance, ’cause I know you’re going through a list. Jill DeWit: No, no it’s all good. Steven Butala: The other thing too, I’ve seen with couples trying to work together, if you got the same talent, like … Jill’s a people person, I’m the data person and I enjoy going into the dark room and coming back out four hours later with a perfect mailer. I’ve been doing that for years, and years, and years, and I love it. I look forward to it. I think that makes the back of her teeth hurt. Jill DeWit: It makes something hurt. Steven Butala: But I don’t answer the phone anymore, and Jill does all that stuff, so then it works. If both of us were data people, I don’t know if this would work. Jill DeWit: It’s true, it would be very hard. Steven Butala: We would have to hire somebody. Jill DeWit: Right, or we both just love the phone and the sales part of it, who’s gonna buy anything? Who’s gonna send out the offers. Steven Butala: The only reason this works for us, I’ll tell ya flat out, ’cause we’re getting into the time mark here. A, we don’t work in the same office at all, we don’t work in the same zip-code. We get together for the show, we get together for live events. To an outsider it seems like we’re always together. A listener, or a watcher, or live event attendee. That’s just not the case at all. We would kill each other. That’s just the truth of it. Steven Butala: We have different ways that we do transactions, we have different ways that we go about managing these other companies like Land Academy, and TitleMind, and Offers2Owners and all of it. The fact is, Jill runs some of ’em and I run some of ’em. Jill runs most of them. Steven Butala: Who wants it. Steven Butala: If they don’t want it, then it’s not gonna work. Jill DeWit: They should be in charge of X entity or what part of the business, and you just let ’em go. Steven Butala: Well said. For better or for worse. Even if you think you could run it better, just get out of there. Jill DeWit: Let ’em go, let ’em do it their way. You’re responsible for your stuff, otherwise, if you’re constantly in each other’s work … I was gonna use other words, but, crap. I can say that. You’re gonna make a mess and nobody’s happy. Steven Butala: Never heard you say that. Jill DeWit: What’d you say? Steven Butala: “No one is happy.” That’s my definition of compromise. Steven Butala: Great. No one’s happy. Steven Butala: Oh my god. Jill DeWit: Wait a minute. You understand the lingo … This is funny! Steven Butala: I thought you were gonna say this as a joke, you’re serious? Jill DeWit: I am serious! No, listen to this. Jill DeWit: Well hold on a moment! Let me tell you, let me finish my thing please. Steven Butala: It’s ugly, is what it is. Go ahead. Jill DeWit: Listen to me. This is a true thing though! Say you’re out, you understand the lingo, you don’t have to explain things over and over again, like, “How was your day dear?” You don’t have to explain that. You’ll come up hopefully your own way of communicating, hopefully it will be shorter. And you have your own language and all that. Now the con is, at diner parties, you’re those weirdos. Steven Butala: Here’s the thing, all kidding aside. Someone’s got to be in charge. Name one company that’s ever had co-CEO’s. It doesn’t exist for a reason. And projects? There’s always projects, always. We never work on them together, it’s always separate. Like, this podcast is mine. Jill DeWit: I write my notes. Steven Butala: And I produce, it. Steven Butala: And I’ve heard, if you go out on iTunes, Jill and I have done them when we’re stuck in a car for a while, we go and listen, always couple podcasts, because they’re always at each other’s throats. It’s funny. Jill DeWit: It is funny. Steven Butala: I wanna do a show like that, ’cause it’s just natural. Jill DeWit: It’s true, “Are we done yet?” It’s kinda funny. You’re right. Steven Butala: For real estate, someone’s got to be in charge of acquisitions, and someone’s gotta be in charge of sales. We didn’t even sit down and think that, the first deal we every did together. Jill DeWit: No, it just happened. Steven Butala: I had a bunch of leftover deals a long time ago, inventory, just property that I owned outright, and Jill, for whatever reason, I think she didn’t like her job at the time. Or she wanted extra money, I’m not sure, which doesn’t matter. She just turned it all into money. Like, I didn’t even tell her. So, that’s just natural. If that’s the kinda situation that you’re in, and there’s just natural, like people are all into it, one part of it and the other. Then you’re good. Steven Butala: But I’ll tell ya, I have to say. I do not recommend working with your spouse at all. I mean it. Jill DeWit: It’s hard, that’s true. Thank you. Steven Butala: It’s profitable as hell. Steven Butala: The con side of that is, all your eggs are in one basket then, too. I mean that’s why we have lots of companies. We have real estate companies, we have Land Academy, we have House Academy, because one of ’em goes down, it won’t sink the ship. Steven Butala: That’s a topic for a different show. 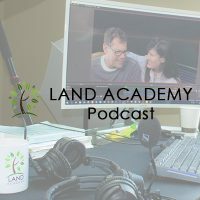 Steven Butala: Well you’ve done it again, you’ve spent another 15 minutes or so listening to the Land Academy show. Join us next time, where we discuss true confessions of Steven and Jill. Jill DeWit: This outta be good. And we answer your questions posted on our online community landinvestors.com, it is free. Jill DeWit: What kind of confessions are we sharing tomorrow, by the way? I didn’t make … I gotta think about this. Steven Butala: “How many people in your group are really doing really, really well?” I’m gonna answer all … ’cause we’re always honest about it. One of the greatest compliments I got from a guy two years ago, actually it was Justin, before we were working together. He said, “You guys are always straight-up about it.” So I’m gonna be straight up about it, how much does it cost for me to live every month? What happened with my job? And this is what drove me to do some deals and do well. Jill DeWit: We’re not going to talk about our weight or age or anything like that, right? Jill DeWit: Just to clarify. Steven Butala: I will never put you out of your comfort zone. Steven Butala: At least on the air, anyway. Jill DeWit: We hope. Thank you. Please rate us wherever you are watching and listening. We are Steve and Jill.